An ambitious use of the Hubble Space Telescope hopes to map some of the biggest, brightest and furthest galaxies to understand the structure of our universe. Above is a picture from that survey, featuring a strange, warped feature called the Dragon. 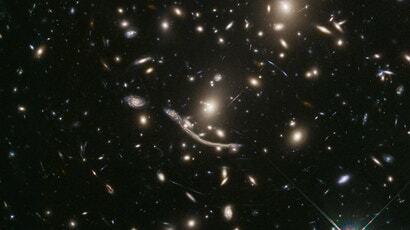 You may have seen the Hubble Deep Field image — the telescope pointed to a seemingly dark spot of sky, only to reveal it glimmering with distant galaxies. A new survey seeks to greatly expand on previous observations of these objects, called the Beyond Ultra-deep Frontier Fields And Legacy Observations (BUFFALO) survey. The knowledge gained could help scientists with their understanding of the deepest questions about our universe, such as why it has its structure or the quantity of dark matter. “We’re going to get a super high-resolution image with Hubble of these galaxy clusters, which will allow us to better understand the first galaxies,” Mathilde Jauzac, research associate at Durham University, told Gizmodo. BUFFALO plans on using 160 hours of Hubble observation time — that’s a lot — in order to double the size of current maps around six distant galaxy clusters originally imaged during Hubble’s Frontier Fields survey. Basically, they are updating previously gathered data in order to determine how many and how distant the galaxies are, information that could constrain theories of how the universe evolves. The observation will reveal some of the oldest galaxies, from the universe’s first billion years. These observations take advantage of the phenomenon known as gravitational lensing. Gravity warps the shape of spacetime itself, and therefore light will bend around massive regions of space, like galaxy clusters. That light appears to us to be warped. This means that really heavy things in space, such as clusters of galaxies, act like lenses and can produce magnified and warped images of objects located behind them. The so-called Dragon in the centre of the image above is in fact five separate images of the same galaxy, warped by the cluster Abell 370. 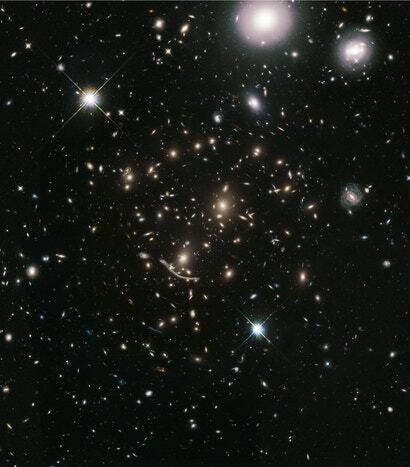 The feature was one of the first examples of gravitational lensing by a cluster ever observed, said Jauzac. There’s a ton to learn from observations of these distant, warped galaxies. Mapping them all out can reveal how galaxies formed and why the universe takes on its strange web structure. Additionally, if you pretended that the Dragon were an arc and traced out the full circle, you could determine how much mass caused the warp. You may be aware that the universe behaves as though it has a lot more mass than we can actually see — the missing mass is known as “dark matter”. If scientists understand the amount of warping and the radiation from both the galaxies and dust in between them, they can calculate how much stuff is missing. This is just the first image of a long observation window and analysis period to follow. Ultimately, much of the effort will help the upcoming James Webb Space Telescope decide where to look in the sky, said Jauzac. I’ll continue saying it: There is a shocking amount that we don’t understand about this universe.